Welcome to the Doctor Who weekly roundup. Where we show you a week in the world of Who. We started by taking a closer look at a scene from episode 7: Kerblam! Special delivery. The Postmen were the subject of this week's case files. The Super Movers visited the TARDIS for some fun and learning. The Doctor needed your help for a live lesson on Friday, where schools across the country learned about light and the solar system. On the 23rd of November, we celebrated 55 years of Doctor Who. We took a look at every title sequence over the history of Doctor Who. Mandip and Jodie went head-to-head in an art challenge. CBBC - Blue Peter went behind the scenes to see how the Thirteenth Doctor wax figure was created. 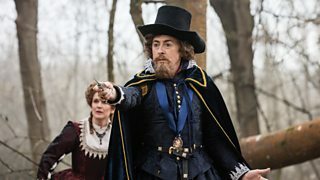 On Sunday night, Doctor Who returned with The Witchfinders. After the episode, we got a glimpse of what’s to come in next weeks adventure: It Takes You Away. ...And finally, we got to know more about Graham O'Brien in Getting To Know Who. Thanks for watching; you can catch up the series so far on BBC iPlayer.